Wow. 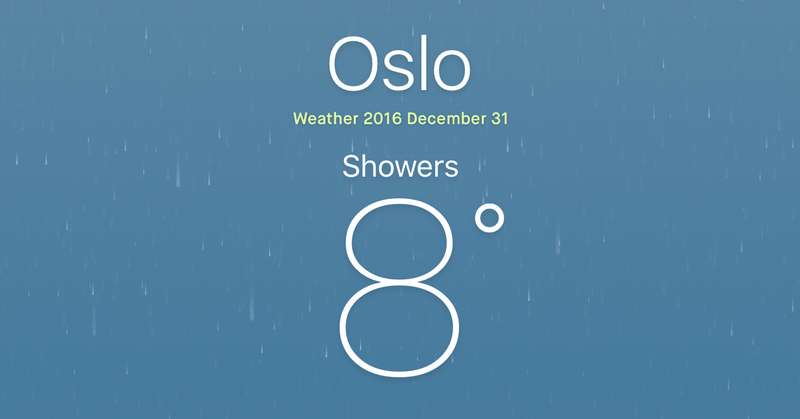 We had temperatures of 8°C (46°F) in Oslo on December 31, 2016. And rain. 2016 is very likely to be the warmest year on record. Again. It’s as if nature wanted to provide us with a final wake-up call before moving into 2017. This should be thought-provoking. Or action provoking. But is it? And if it is, what exactly are those thoughts? And where are the actions? My favorite exam question for undergraduate students in my Environment and Society course is “what were we thinking?” I often ask them to write a letter to someone in the future to explain the dominant beliefs, values and worldviews influencing how we relate to the environment – and to discuss how these were changing, or what was holding them in place. Who or what was thought to have the power to create change? Or I may ask them to place themselves in 2050 and look back and reflect on the discourses, paradigms or thought patterns that created whatever situation they might be experiencing. The answers are usually very insightful, and many of them reveal an impressive understanding of social change. They make me realize that the thinking about climate change is actually changing, at least compared to when I was a student. What was I thinking when I was a student? In the hot summer of 1988, I was just starting graduate school at the University of Wisconsin. I was both concerned and curious when I read about James Hansen’s testimony in front of a U.S. Congressional committee, where he said that it was 99 percent certain that the observed warming trend was not just natural variability, but caused by increases of carbon dioxide and other greenhouse gases in the atmosphere. I wanted to learn all that I could about climate change and its implications for society. But in all honesty, I did not really expect to see or experience the impacts in my lifetime. It was too distant and abstract. Almost 30 years later, climate change is no longer distant and abstract. It is here, it is clear, and we have the opportunity to do something about it. The future is now. This means that it’s time to ask different questions and take different approaches. For example, “How can we transform society rapidly to avoid dangerous climate change, and do so in ways that are equitable, ethical and sustainable?” Unfortunately, we are also starting to ask “How do we deal with the human, non-human, or cultural losses? (see article by Barnett et al. 2016). My own research (AdaptationCONNECTS) and thinking is now focused on how to successfully adapt to the very idea that we are responsible to the future, and that the future is here and now, not off in some abstract, distant time. But over the years, my concern and curiosity about climate change have transformed into something more potent and powerful – a commitment to oneness. It is a recognition that integrated approaches work better than fragmented ones, and that gentle actions can be stronger than forceful ones. This doesn’t mean sitting back and doing nothing, waiting for change to just happen. In fact, more and more people are responding to climate change from a position of what Dr. Monica Sharma calls “principled outrage.” Principled outrage is not an emotion, but a space from which people are called to act on behalf of the universal principles for which they stand, whether it is equity, justice or oneness. We are starting to see it everywhere, all over the world. And just in time. Principled outrage is different than anger, which can often be (self) destructive. From a space of principled outrage, climate change is not just another cause, but an opportunity to act with integrity. It is not just about “fixing the climate problem” – it is also about addressing the deeper, underlying drivers of climate change, biodiversity loss, poverty, and injustice, which include the mindsets that perpetuate a fragmented view of the world, and a view that treats many humans and non-humans as if they simply do not matter. Principled outrage does not mean acting against others; it means taking a stand for what really matters. To engage with climate change from a space of principled outrage, where do we begin? We begin by identifying places where things seem to be stuck or breaking down. For example, the conversations about climate change solutions seem to be in a deep rut. Researchers and politicians point again and again to people’s behaviors and lifestyles as the culprits that need to be transformed. This makes sense, since “human activities” contribute to climate change. But it is not working! Nobody wants to be changed, period. Furthermore, this approach ignores the norms, rules, regulations, incentives, and interests that strive to maintain “behavior as usual,” or even work to actively promote lifestyles that are anything but sustainable. What’s missing are the strategies and the stories that connect with people and make them the heroes. The stories that allow people to be the protagonists, rather than merely objects that need to be changed. After decades of trying to engage people with solutions to climate change, it is time to engage people as the solutions to climate change. In other words, to recognize people as agents of change, rather than as agents to be changed. Experimenting with one small change for a limited period of time provides an experience of how change happens, and it becomes easier to see the connections between behaviors and the larger social context. It helps us recognize that we actually have more power than we think. In fact, through actions and conversations, we often influence and inspire others to reflect and consider what they might change. Conversations that generate action are important, since actions generate results. And if there is anything that we need right now, in 2017, it is results. I was reminded of this on December 31, 2016, when it was 8°C in Oslo.